Hawkeye Photographic Studio is situated right in the city centre of Bath, Somerset, UK . Hawkeye studio is available for hire either by the day or by the hour (2 hour minimum booking) depending on your requirements. 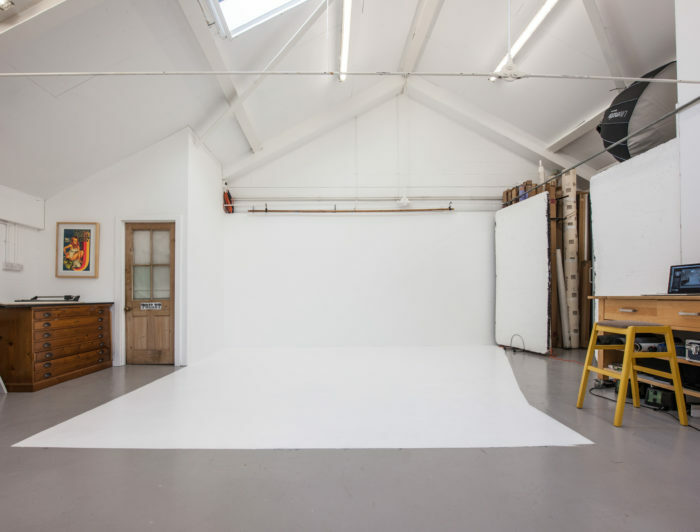 The studio is most suited for photo shoots, video production & workshops, but if you need a big space to do something in…. get in touch & we’ll see if that’s possible! Hawkeye Photo Studio is ideal for fashion photography, portrait photography, photographing small groups of people, corporate head shots, Press & PR photography or still life photography and video production. The kitchen area in the studio can be used for food preparation during shoots or in conjunction with food photography. The studio is ideal for video production as it has a flat solid concrete floor, located in a quiet area & can be blacked out. Please be aware that the studio is not soundproofed. Hawkeye Studio can provide lighting & grip equipment or backgrounds as a separate negotiation if necessary, please get in touch to let us know what you might need. Being located right in the centre of Bath in a quiet area just off Walcot Street (which is known as the “Artisan Quarter”) you can source props, clothes or styling necessities from many of the independent craft, curio shops and workshops all within walking distance. Walcot street also has many bars, cafes & restaurants. Hawkeye Studio is also available for room hire for meetings, as a production facility or as a creative space. The Studio is located on the first floor with easy access for deliveries and equipment (no lift). Total working hire space is approximately 9m x 5m (23Fx19F). Ceiling height over 3.5m. Hawkeye Photographic Studio is approximately a 10-minute walk from Bath Spa train/bus station and less than a 5-minute walk from the city centre and shops. The M4 (Junction 18) is only a 15-minute drive away. Included in hire: Use of camera stand, large boom stand ,Poly boards & steps. Kitchen facilities with sink, microwave, fridge (no freezer or cooker) with tea & coffee included in hire fees. Make-up/dressing area with work desk, hanging rail, iron & ironing board, steamer & mirror. Skylights and large circular window provide daylight (can be easily blacked out using blackout blinds installed). Lighting and background hire available by prior negotiation. One parking spaces is available with prior notice. All other parking at nearest public carpark 2-3 minutes walk. Local shops, cafes & restaurants are a very short walk away. Food/drinks/snacks can be provided with prior notice. Set Building & painting is available please contact Colin to discuss any requirements. A Hawkeye representative will be in the premises at all times while the studio is being hired. £100 + VAT full day (9am-6pm) 8 hours pre-production/ set build/prep/wrap/background painting ONLY in conjunction with photographic/video production. Colorama/background paper (many stock colours- but please check availability): £10.00 per metre. Please note a cleaner may be hired at £15 per hour if the Studio is not left in a clean and tidy condition. Payment is required in full at the start of the studio hire session. All goods left in the studio after the studio hire period should be removed within 24 hours unless agreed otherwise. Any goods left in the studio after that period will be thrown away. Please note that all fees and prices are exclusive of VAT. Confirmations must be received 48 hours prior to date of booking. Bookings not confirmed by 12.00pm two days prior will be automatically removed. We reserve the right to withdraw first options in favour of clients who are able to confirm. Cancellations of confirmed bookings made after 48 hours of the agreed booking date will be charged at 100% of agreed fee. The client will be liable to pay in full any damages that may occur while hiring studio. See terms & conditions below. The client should ensure that they have adequate public liability insurance in the event of an accident. Equipment and valuables left on the premises are deposited at the client’s own risk. “Equipment” means the hired items & the studio facilities, including any fittings, furniture or props. “Hire Period” is the period for which the equipment or studio is hired. Each day is calculated on an 8 hour period from the time at which the Studio or Equipment is hired. Part of a day will be considered to be a full day for the purpose of calculating the Equipment hire charge. IT IS THE RESPONSIBILITY OF THE HIRER TO UNDERSTAND THE EXTENT AND LIMITATIONS OF THE COVERAGE BEFORE TAKING POSSESION OF THE HIRED EQUIPMENT & HIRING THE STUDIO AND THE HIRER SHOULD ENSURE THAT THEY HAVE ADEQUATE INSURANCE TO COVER ANY LOSS DAMAGE OR ACCIDENT. Our charges do not include a specific fee for the Damage/Loss cover, you are liable for all replacement cost and against all forms of loss or damage. You will pay to Colin Hawkins on demand all money you receive from an insurance company or any other source in settlement of any claim relating to the loss, theft or damage of the Equipment or studio. You must not compromise any claim without our express consent in writing. Our equipment is serviced regularly and every effort is made, therefore, to ensure that the Equipment & studio is supplied in working order. Colin Hawkins cannot be held liable, however, for failure to Equipment or for consequential or sub-consequential loss there from. IT IS STRONGLY RECOMMENDED THAT THE HIRER TESTS THAT THE EQUIPMENT FUNCTIONS PROPERLY FOR ITS INTENDED USE PRIOR TO COMMENCING AN IMPORTANT ASSIGNMENT . Any breakdown or unsatisfactory working of Equipment must be immediately notified. Under no circumstances must you repair or attempt to repair the Equipment unless authorised by Colin Hawkins. The Equipment and any furniture or props must not be taken from the premises. You must notify Colin Hawkins immediately if the Equipment is involved in any accident resulting in damage to the Equipment or to other property, or injury to any person. 2. Not charge you for the hire charges of the defective Equipment. It is your responsibility to make sure that all the people who use the Equipment are properly instructed in its safe and correct use & that you have requested & received adequate instruction on its safe and correct use. You must ensure that the Equipment is not misused, and that supervision is adequate at all times. It is your responsibility too ensure that the Equipment is suitable for the purpose for which you intend to use it for and that you will give us sufficient information to ensure that the Equipment supplied is suitable for that use. It is your responsibility for the Equipment & it begins when you receive the Equipment or enter the studio during the hire period. Your responsibilities include safe keeping of the Equipment and protection against the elements of theft, vandalism or improper use. You are responsible for the return of the Equipment . You must not sell or otherwise part control of the equipment. The Hire Equipment remains the property of Colin Hawkins at all times and must not be pledged, loaned, deposited or sold to a third party. You will indemnify Colin Hawkins against any and every expense, liability, financial loss, claim or proceedings whatsoever, and in respect of any death or personal injury whatsoever or damage to our loss of property whatsoever arising out of the use or non-use of the Equipment or any parts of it. Equipment lost, stolen or damaged while in the Hirer’s possession will be the entire responsibility of the Hirer. Any items not returned from hire, such as cables, sync leads, props etc. will automatically be charged to the Hirer’s invoice at the full current replacement cost. You will not remove, deface or cover up our name plate or mark on the Equipment indicating that it is our property or damage or deface the studio premises fittings, furniture or props in any way. All goods are advertised subject to availability. Colin Hawkins reserves the right to change both the prices and the Equipment available for hire without prior notice. Spare modelling lamps will be replaced but the hirer is liable for any damage arising from breakage of flash tubes and/or bulbs, valves, transistors, capacitors or integrated circuits. Colin Hawkins can not be held liable for any disruptions to your shoot caused by a third party, nor can we be liable for any loss or damage to any personal equipment or items whilst hiring the studio. Colin Hawkins will not be liable for any indirect loss, loss of business profits, savings you expect to make, wasted money, wages, fees or expenses due to unsuitability, breakdown or stoppage of the Equipment or any part of it. Colin Hawkins will not be liable for any delays caused by any circumstances beyond our control. Acceptance of the Equipment by the Hirer signifies the total acceptance of these terms and conditions for hire and excludes any terms and conditions you may have put forward except where we have agreed to any amendments or other conditions in writing.